Mona Lisa is one of the most talked about and famous paintings in the world. It was painted by Leonardo da Vinci, the most talented artist of the Renaissance period. There is also a mention of MonaLisa in the Da Vinci code. Somehow this painting always intrigued me and I wanted to see this for real. 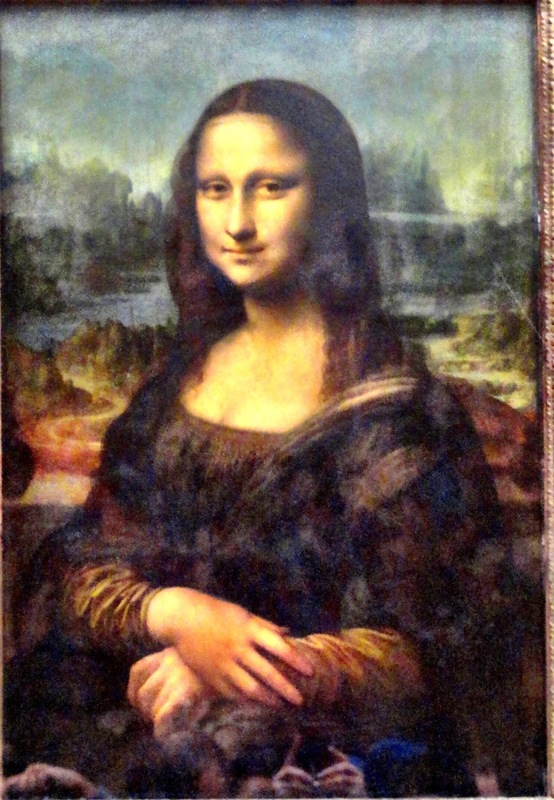 There is so much researched about this piece of art, and when I got a chance to visit the Louvre, the first thing I did was to head straight to the Mona Lisa room. In fact Lourve is a huge museum which hosts works of many artists from the Renaissance period - including Michelangelo, Leonardo da Vinci and many many more. Spread over 60,600 square metres, you cannot cover everything even if you give it an entire day. But as soon as you enter, there are sign boards which tell where is the Mona Lisa, surely this seems to be the most important place in the entire museum. The moment we entered, we wanted to pay our visit to the most talked about lady in the world, so we headed straight to the room where Mona Lisa resides. As a first impression, I was a bit taken aback with the swarm of people trying to get a glimpse of the lady. There are so many researchers, scientists, students, artists, who have applied their brains in analyzing the Mona Lisa, so to pay due respect to them, I also wanted to quote a few first impressions. Is she a Male - Some researchers feel that Mona lisa is one of the most beautiful women in the world, natural mysterious smile and long hair. While others feel that there are reflections of Male personality on her face, especially Da Vinci kind of imposed his own face cuts, and then gave it a shape of a woman. I agree, she is not a very pretty lady, but her looks are enticing. The more you gaze at her, the harder it is to look away. Features of her face definitely look a bit male-like, it looks like a Man wanted to dress in a female costume and get himself a portrait. People say it is a portrait of Lisa Gherardini, the wife of Francesco del Giocondo, but there is no evidence that proves it. Mystery of her smile - Well, there has been lots of analysis on her mysterious smile. There are moments when she smiles and then suddenly she stops smiling. The colors have been layered in such a way that from different angles, viewing distances and lights, her smile evolves. I have personally felt that. One moment you might feel that she is happy and looking afar to her lover and passing a faint smile. At another moment, it seems she is depressed and has lost all faith in life, her eyes look sunken and your heart cries out for her. No Eyebrows - If we call her a beautiful woman, it is important to note that she has no eyebrows. It scares me a bit thinking why Vinci did this to her. Research shows that initially Vinci painted her with eyebrows, but over the years, cleaning and fading of colors made her what she is today. Though overrated, I still feel Mona Lisa was worth a visit once in your life-time. How to Reach - This is kept in Louvre Museum in Paris, also known as Musee de Louvre. If you are going by Metro, get down at the station 'Musee the Louvre station', (Metro Lines M1 and M7)there is a subway which takes you directly to the basement of Louvre, otherwise you can also walk through the road above. Tickets - The ticket to Lourve museum is around 15 Euros, and it is totally worth it, you can spend your entire day at this museum, if you are an art lover. There is also a ticket, which covers 2-3 museums in Paris, but I am not a museum person, so I only went to one. Photography is allowed and is free. 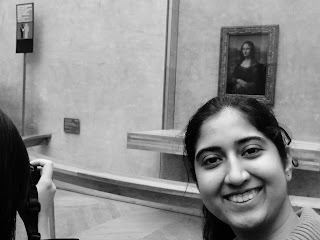 With so many other wonderful paintings at display in Louvre Museum, I felt the painting of Mona Lisa to be slightly overrated! True!! Initially I also felt that it is a bit over-rated but when you observe closely, I was impressed with it.. Thanks Arun for visiting my blog!!! There is no end to mystery. Visited this last month. Was disappoinited to see the Mona Lisa so far away. Louvre was awesome though. I'd been there in 2009 (seems like ages ago now!). enjoyed refreshing those memories. 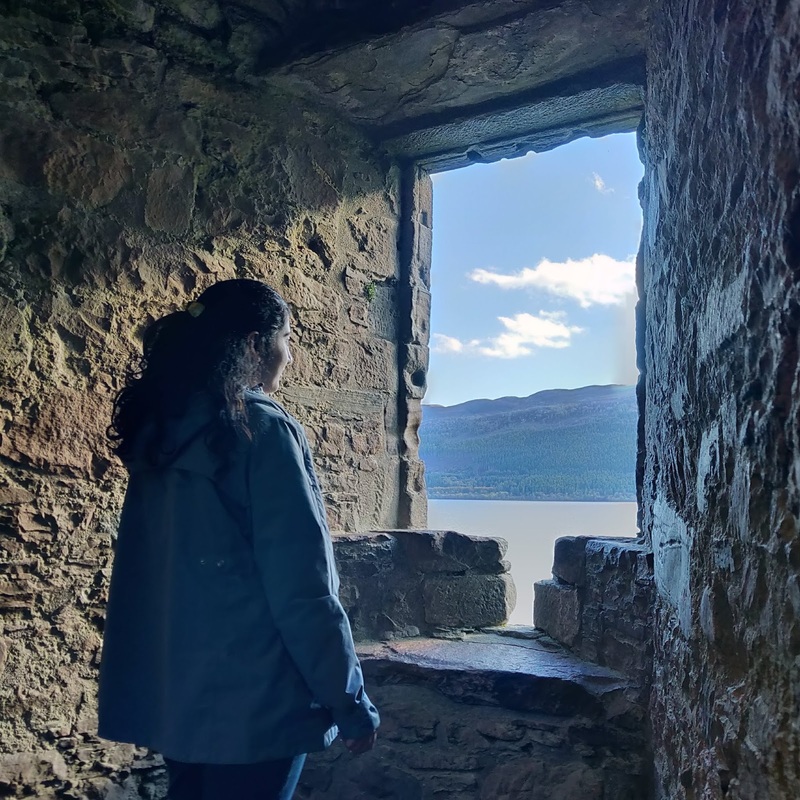 No end to mystery.Nice and interesting post here. Thanks for this. What a interesting place to visit! Still searching for the answer whether this Mona Lisa was real.. Thanks dear .. True it is a mystery !! Oh, how much I wanna visit the Louvre someday. My buaji has her own Monalisa in her living room. When I was a kid, each time I visited her house, I used to look at the painting and wonder who is the lady, for her face matched no one in their family! It was only years later, in 7th std that medieval history gave me her correct introduction. Each time I look at Monalisa, I smile at my innocence back then! Thanks Shaivi for reading the blog!!! Indeed I have also seen Monalisa paiting during my childhood days and wondered about her!! !